As your parent gets older, their medication list can get longer and more complicated. Seniors face multiple ailments and illnesses which can come with a number of medications and different dosages. Sometimes it can get difficult to keep it all straight—the dosage, time of day, with food, without food, drug interactions, etc. This task can be daunting for a caregiver. The more prescribed drugs taken for the different conditions your parent develops, the higher the chance that they will experience dangerous side effects as the result of drug interactions. You want to avoid mistakenly giving the wrong drug or dosage. As a caregiver, you can help prevent these problems by being organized and making sure your parent’s physicians and pharmacist know about all of the prescription drugs that your parent is taking. It seems simple enough but keeping a printed list of all medications that your parent is currently taking is essential. This complete list should include all prescription medications along with over-the-counter medicines taken by your parent. Print multiple copies of this list. Keep a copy in your parent’s home and one updated list with you at all times. Update and share this list with your parent’s physician during their next appointment. This list should outline the medication name, the dosage, and the reason that it was prescribed. We lead busy lives and are overloaded with information daily so we can easily forget the details associated with each medication. After you read the printed materials with their prescribed medication, file this documentation in a master folder. The information will be on hand if you have any questions regarding the side effects or dosage. If possible, have your parent’s medication fulfilled at one pharmacy. A single pharmacy can better track all the medications and flag any issues or potential drug interactions. This is an additional safeguard for your parent’s health. Repetition can help with remembering to take a medication. Determining what medications to take when they wake up, with a meal during the day, or before they go to bed will help your parent remember to take their medicines. Some of us like to check items off a list or prefer visual reminders, a chart or calendar can be helpful. Make a graph or daily calendar of their medications and chart the time of day and dosage that is clear to understand. Keep this posted in a central location and update as medications change. There is a multitude of pill organizers on the market. They can be as simple as a pill organizer for the week or for the month. Some come with departments for 2 dosages per day, and others even have alarms to alert your parent when a pill needs to be taken. A pill organizer is a clear way to know if a pill has been taken and to eliminate confusion. But before you sit down to fill your pill organizer, make sure you are clear on the dosage for each pill and where it needs to go. You don’t want the organizer to be set up incorrectly from the start. With the number of medications that you might be juggling for your parent, another option is to use a reminder service from a medical alert company. They can phone or text your parent to alert them when a medication needs to be taken. There are several medication reminder smartphone apps on the market with helpful reminders at your fingertips. These apps can make taking medication as easy and automatic as possible. An app can keep medications organized clearly in one place and remind you when a refill is needed. Let modern technology make pill reminders easier. 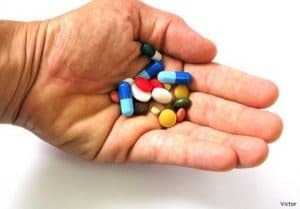 Now that you have the organizational measures in place to manage the medications for your parent, it’s important to also note how to dispose of unused or outdated medications. Close to 40% of all medications purchased in the United States annually remain unused. Many of us are guilty of having expired over-the-counter medications sitting in our bathroom cabinets that are not needed or no longer useful. It is important to dispose of these medicines safely, so you do not harm others or the environment. Also, be proactive to avoid getting more medications than you need in the first place. Check with both your parent’s physician and pharmacist so you don’t receive more pills than your parent can use before the expiration date. If you purchase medications online, double check that the refill schedule does not leave you with too many. When buying over-the-counter medication, check your medicine cabinets and keep a list of what you are out of and only plan to use. Planning your medication appropriately will help you avoid expired medicines and help your family save money in the long run.